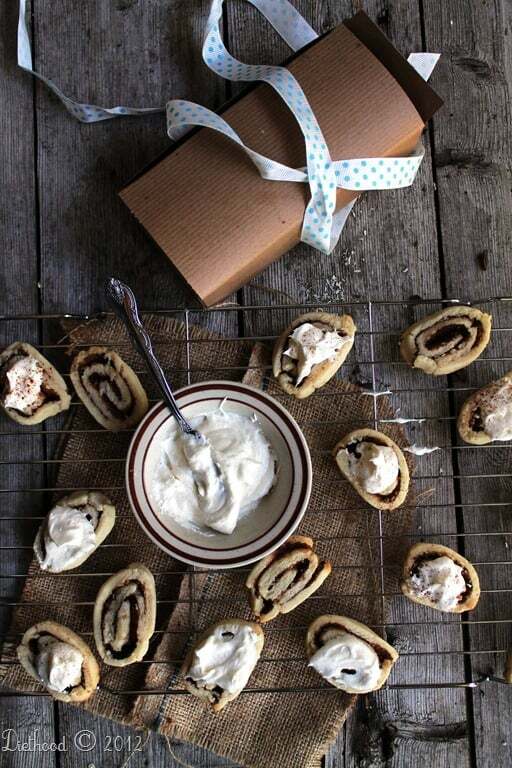 Cinnamon-stuffed rolled sugar cookie dough, topped with a delicious Cream Cheese Frosting. Did I tell you I had a baby 4 months ago? Lack of sleep – I can’t remember if I told you, but I’m pretty sure I did. I also am pretty sure I mentioned that I gained 40 elbees during my pregnancy. 20 of it went as soon as I had the baby, but I’m kinda workin’ on the rest. And workin’ I am; changing diapers, feeding every couple of hours, playing, picking up the older one from school, teaching, drawing, feeding again, bathing… You know the story. Sometimes I get to hop on the treadmill and enjoy a walk or even a run. That’s very rare, but I do it as often as possible. I now have lost another 12 pounds. Yay! Only 8 more to go to get back to my pre-preggo weight. Not bad, eh? So. I decided that I was going to treat myself with a gain of 2 pounds and round up that number to 10 pounds left to lose. Fair? I think so. 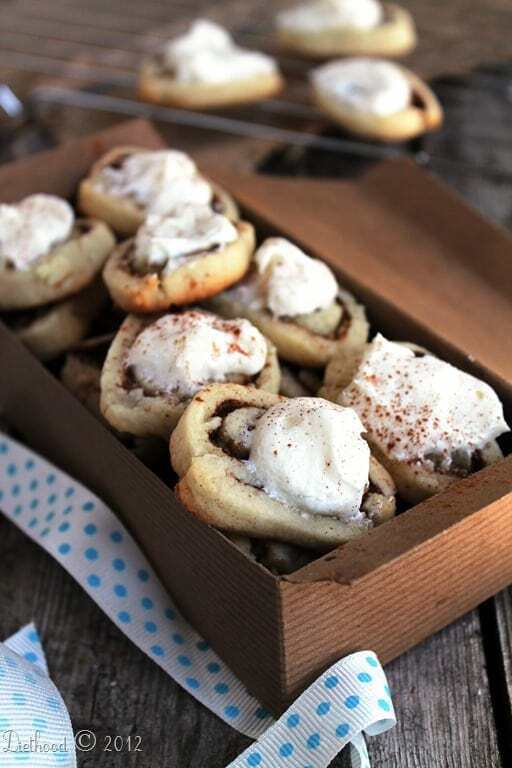 And what better way to do that than with a cinnamon roll sugar cookie. I even wrapped it up like a present and gave it to myself. I deserve it. I hope you do the same. You deserve it, too. These cookies were so good. Please make these. You’ll love yourself for it. And, take your time when making them. The only issue, really, is when rolling the dough into a log. Just follow my directions and you will do great. Then there’s the cream cheese icing. Oh MY Word! It’s almost the same as the Cinnabon Icing. You can find it Spicie Foodie’s Awesome Christmas Cookie Recipes. Try not spooning it into your mouth. I dare you. Especially since you’ll only use about half of it for the cookies. The other half can go straight to your belly. You can also use your favorite sugar cookie recipe or use a store-bought roll. In a medium-sized bowl whisk together the flour, salt, and baking powder. Set aside. In a large mixing bowl beat the butter and sugar with an electric mixer until light and fluffy, 3 to 4 minutes. Add the egg and vanilla extract and beat until combined. Pour in the flour mixture and beat until you have a smooth dough. Flatten the dough into a disk and wrap in plastic wrap. Refrigerate for 30 minutes. Take out a large piece of aluminum foil and flour it. Take the dough out of the fridge and place it on top of the foil. Roll it out into a rectangle, about 1/4-inch thick. 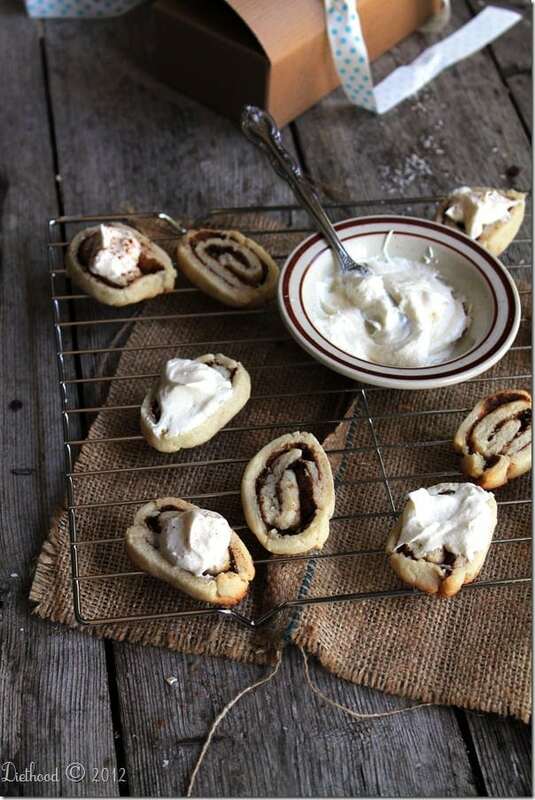 Using your hands, spread the butter over the entire dough; sprinkle with cinnamon; sprinkle with light brown sugar. Holding onto the corners of the foil, those closest to you, begin to roll the dough away from you. Work slowly. Roll to the end of the foil. Take out the cookie dough, unwrap it, and cut the cookies off the roll, about 1/4-inch thick. Place the cookies on an ungreased cookie sheet. Bake for 8 to 10 minutes, or until they begin to brown around the edges. Remove from oven and let cookies cool on baking sheet for 2 minutes before transferring to a wire rack to finish cooling. Once cooled, frost with icing. Frosted cookies will keep several days in an airtight container. Thank you. Also could these be left in the freezer overnight? Are these cookies soft or crunchy? There’s a bit of crunch when you bite into them, but the inside is soft. I made these and they are absolutely amazing! Took them to work and the staff LOVED them. Thank you for this recipe. A definite keeper. Hi Karen!! That is awesome! I’m SO happy you all enjoyed them! How important is the lemon extract in the icing and could I substitute lemon juice for it?? I have everything to make these cookies except that darn extract!!! I make a similar cookie but I use pie crust instead of cookie dough. And I make butter cream icing to top them. WHOA! And YUM! Thanks for the idea, Cindy!! Hey! these cookies were great(the second attempt) The first go round, I used pillsbury dough and they turned into blobs. I tried freezing them longer thinking that might work, but it didn’t change. Just thought I would let you guys know to not use store-bought dough. From scratch is always better! Thanks, Holly!!! I will definitely make a note of this in the recipe so that others will see it. I CANNOT BELIEVE you are pulling this off…from the cooking to the posting to the photography, etc with a 4 mo old. Omg. Only a new mother AND a blogger knows what that means. My hat is off to you. I didnt start blogging til my ‘baby’ was about 18 mos old. Never could have done it at 4 mos! Haha! You are too funny. But I think you totally deserved these cookies! Just waking up in the morning and wrangling two munchkins puts you on the “deserve a cookie (or 12)” list. And these sound like an amazing cookie to have treated yourself with! I have a huge weakness for cinnamon rolls so these cookies look heavenly! OMG amazing! I will most definitely be making these soon. I say yes to the plus 2. Everyone needs presents to themselves. I take this very seriously and make sure I get it done at least once a month. 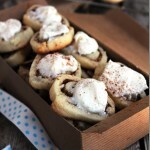 These sound decadent and delicious! I have a feeling a few spoonfuls of icing would make their way into my mouth…all for quality control purposes, of course! Hope you’re enjoying your weekend! Congrats on the weight loss–you definitely deserve a treat and I can’t imagine anything better than these cookies. They’re so pretty and I love how you styled them here. The cream cheese frosting takes them over the top (in a great way)! LOVE the cookies ~ had to pin them twice! these cookies look amazing. I’m sure you’ll get to you pre baby weight soon just keep lifting both your kids you’ll be back in no time. I think you totally deserve those cookies! And they look delicious too! The cookies look delicious. I’ve already bookmarked them, so I can make them. You’re doing better than most of us since you just had your baby…. I had mine almost 6 years ago and I could still use to lose another 20lbs. 🙂 These cookies do look fabulous. 🙂 Have a great weekend. I just want to get my hands on that box of cookies and sit under a tree and enjoy these…lol. Oh I totally want that box to be mailed to me! These look fantastic, Kate!